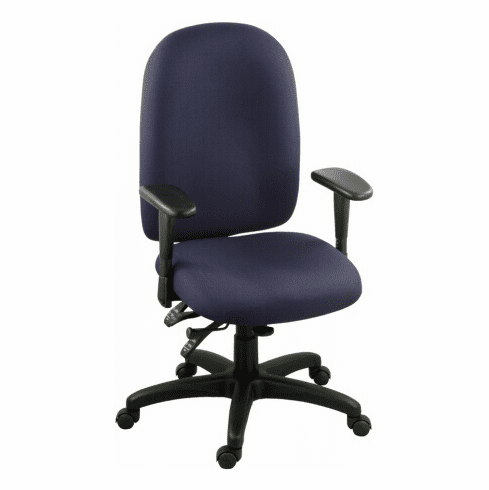 Ergocraft Palisades High Back Office Chair [E-50184] Free Shipping! The Palisades high back office chair from Ergocraft features a multi-function adjust mechanism that allows the user to modify the height and angle of their chair for maximum support and comfort. Other features include thick foam filled seat and backrest cushions upholstered in commercial grade stain resistant fabric, independent seat and back angle adjustments, height adjustable backrest, pneumatic seat height adjustment, tilt with tilt lock and tilt tension adjustment, 360 degree swivel, adjustable up/down in/out T-arms included, multiple arm options available, heavy duty nylon base included, optional steel base upgrade available and dual wheel carpet casters included with optional hard floor casters available. The Palisades chair from Ergocraft can also be upgraded to a 400 lb. capacity big and tall chair or converted to a multi-shift 24/7 chair by selecting the corresponding option. This chair meets or exceeds ANSI/BIFMA standards. Dimensions: Seat Size: 20"W x 19.75"D. Back Size: 19.5"W x 24"H. Overall: 39.5" - 47.5"H x 28"W x 22"D. Weight: 63 lbs. 12 year limited warranty from Ergocraft. This chair normally ships within 5 business days from our CA warehouse.